The one “look” that defines most young people’s apartments (other than overall sloppiness) could very well be the wires running across the floor from their TV or audio receiver to their speakers. After all, when you’re probably not going to live somewhere very long – and when you’ve got friends to see and partying to do – who has time to worry about running wires carefully in order to make everything look nice and neat? You’re not living in your first apartment anymore and a mess of wires all over the place is no longer a sign of youth, it’s a sign of either laziness or carelessness. Either way, it’s not the way that an adult’s home should look to visitors, whether they’re family who will shrug off your lack of attention to detail as just “business the usual,” or friends and co-workers (or even a boss) who may draw unwanted conclusions from your messy home. 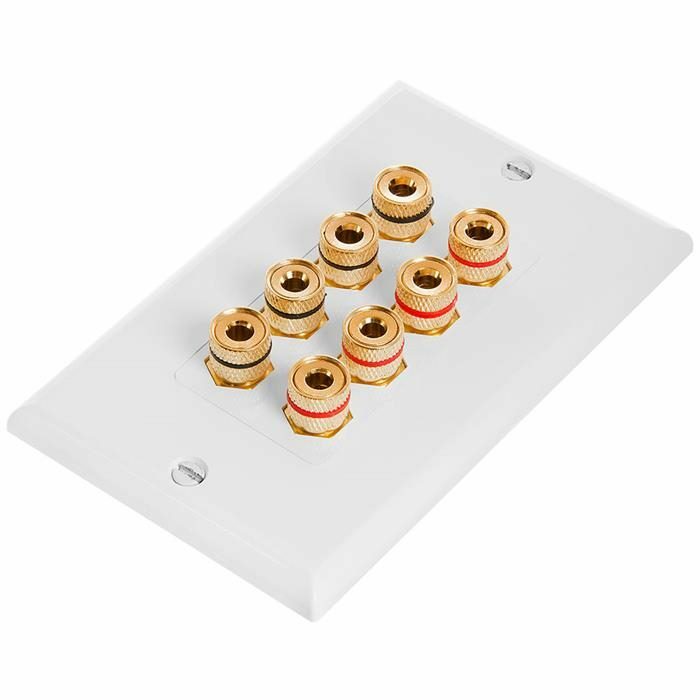 These Cmple two-piece (a base with the posts, and an attractive white cover) wall plates are no larger than a regular AC outlet and are designed to work with banana plugs (front and back), but can easily be used with spades or bare wire if you’d like. With eight posts on each plate, you just have to screw stereo cables and you’ve got four speakers properly connected with absolutely no mess. 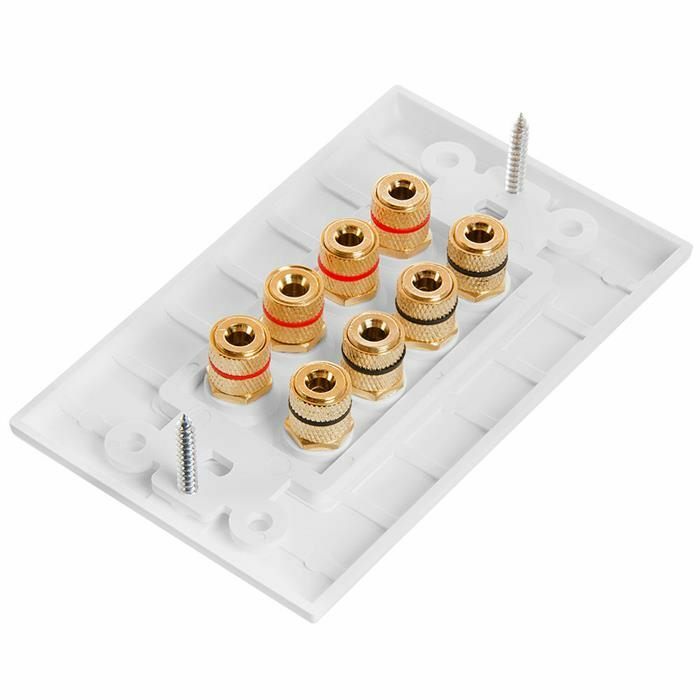 All of the connectors, front and back, are gold-plated to prevent any corrosion which might develop over time, and to eliminate any audio noise which can be created by poor connections. 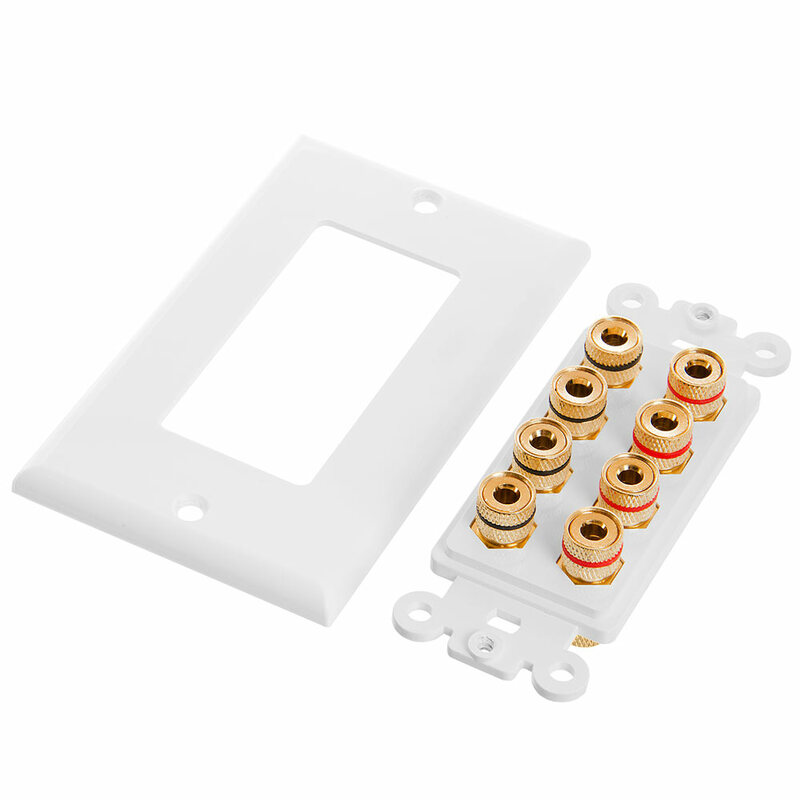 There’s nothing simpler than using these wall plates; no soldering is required, and all you have to do is mount the plate and screw on the cables. Job done. When you want your home to look like a grown-up lives in it, new furniture and carpet can cost a lot of money. Cmple wall plates which will allow you to get your speaker cable off the floor cost less than five dollars apiece. They’re a great place to start.